Querrien is a small village in the northwestern part of France known as Brittany. 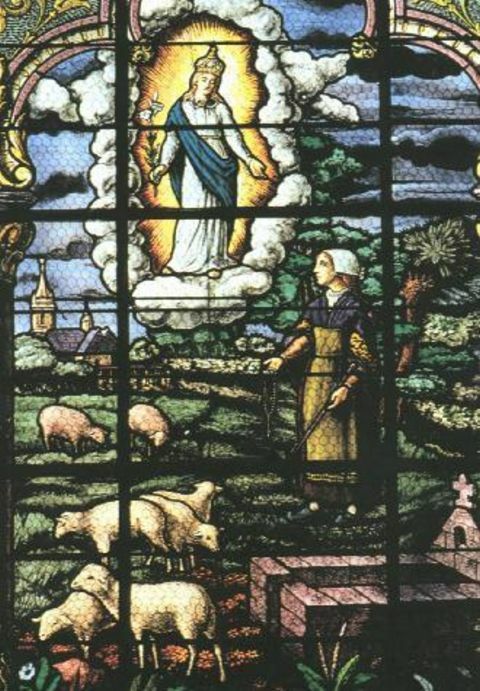 On August 15, 1652, Jeanne Courtel, age 12, was a poor shepherdess tending her father’s flock of sheep. She had been both deaf and mute ever since her birth. She was reciting her prayers when she was surprised by the sudden appearance of the Blessed Virgin. Our Lady was holding the Child Jesus on one arm and holding a stalk of lilies in the other. Jeanne also related that her father should dig in the nearby pond to find a statue of this Lady that had been buried there for centuries – according to Our Lady. The father asked his daughter if the Lady had stated who she was? Jeanne Courtel is healed so that the Virgin Mary can complete her mission. In the days that followed, the Virgin appeared again and repeated her request for a chapel. History states that in the year 610 A.D., St. Gall had visited the region to erect a hermitage. He had sculpted a statue of the Virgin Mary. During a disastrous time in the region, the chapel that he had built was destroyed, and the statue was lost. But, on August 20, having been divinely directed by Our Lady to search the pond for the statue, it was duly found and proved to be in excellent condition – despite having been buried in water for centuries. During that same year of 1652, Msgr. Denis de La Barde, bishop of that region, made an appearance on September 11 and was informed about all that had taken place. Several days later on September 20, after conducting his investigations, he formally recognized the validity of the apparitions and blessed the first stone of the future chapel. The chapel was begun that year in 1652 and was completed four years later. It was enlarged in 1779 because of the large crowds that visited the shrine. The body of visionary Jeanne Courtel was entombed within the shrine after her death in 1703 at the age of 63. On August 14, 1950, some 20,000 pilgrims visited Querrien for the coronation of the miraculous statue by the local bishop — who did so in the presence of many ecclesiastics. One of the most splendid ceremonies to take place at the shrine was that in honor of Cardinal Lustiger, Archbishop of Paris, who paid homage to the Madonna and then blessed the new buildings on September 10, 2000. The shrine of Our Lady of Eternal Aid is proud to announce that it is the only one in Brittany that has been authenticated by the Catholic Church.